I lost an inch off my hips whilst training for Miwok 100k in 2018. This left me in a real pickle because my pants just would not stay up. I had a belt but no buckle, so I set out to get a belt buckle the easiest way I knew how… by completing a 100 mile race. 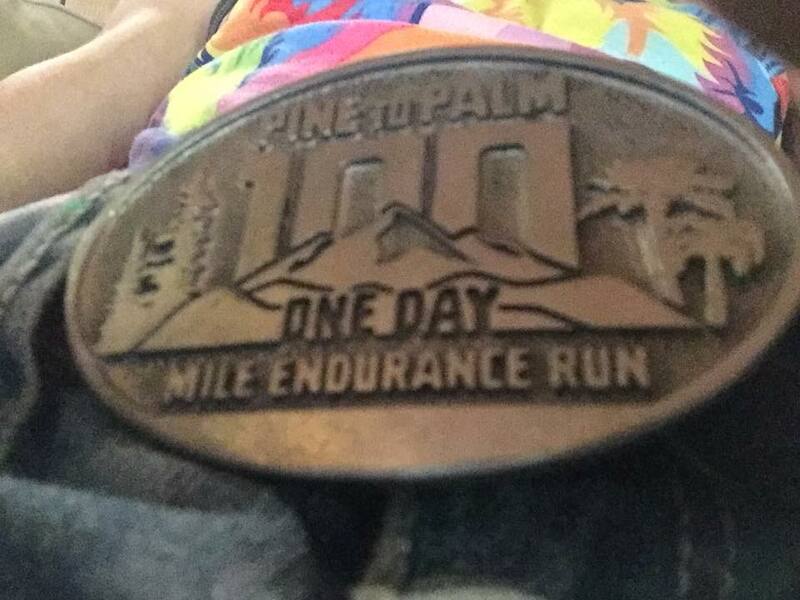 Though there are seemingly hundreds of races to choose from lately, including one in my own back yard on the very same day, it was Pine to Palm 100 that met all the criteria I was looking for in such a race. 1. Point-to-Point: No silly washing machine nonsense. 2. In the mountains: The Siskiyou Range in Southern Oregon provides sizable climbs with great views. 3. Easy registration: I did not have to enter a lottery, sign up a year in advance, or submit a resume. In 2017 Pine to Palm was cancelled due to nearby wildfires which I noticed managed to even burn part of the route. This year, fires to the south meant a long detour, increasing travel time and causing rather severe smoke right up until race day when miraculously the race gods kicked up a breeze and the smoke moved out. The course was still a bit smokey, but not terrible. The Pine to Palm course is a point-to-point course beginning in the small town of Williams and finishing right near downtown Ashland, Oregon. The course features 3-5 notable climbs (depending what one considers a notable climb) winding through the mountains touching the summits of three peaks and two buttes. Greyback Mountain (7,048 ft), Stein Butte (4,308ft), Squaw Peak (4,964 ft), Dutchman Peak (7,418 ft), and Wagner Butte (7,255 ft). Here is the Pine to Palm course profile on the back of some race swag. For the most part, the climbs are not particularly steep, but rather gradual and long. Though I don’t have an exact measurement of the terrain, I am going to estimate that about 49% of your steps will be on single track trail, 49% on fire roads, and 2% on paved roads. There are some small sections that have tricky terrain, but for the most part, even the single track is rather non-technical terrain with good footing. The views durning the run were lovely despite visibility being somewhat impaired due to smoke, and much of what I suspect was the most beautiful areas of the course I ran through in the dark. Pine to Palm 100 mile endurance run is the child of Hal Koerner, who is 2-time Western States Champ, won a whole bunch of races, literally wrote the book on ultrarunning, and is the owner of Rouge Valley Runners, the local running shop there in Ashland, Oregon -I suggest you stop in for a visit before you leave town. Turns out, Hal is also an awesome guy, and puts together a well oiled 100 mile race, with the help of his legions of smiling volunteers. Along the Pine to Palm course there are aid stations about every 7 miles or so - staffed by crazy happy and helpful volunteers, and all the usual snacks you have probably come to love and expect at any ultra event. Drop bag and crew locations where also plentiful. Most folks reading this are likely interested in the race itself so I saved the details about MY race for the end. My race went well. I set a goal to finish in under 24 hours, and I did, though I had some missteps along the way. I started out at what I felt was a rather conservative pace. My plan was to try to average 5 miles per hour during the day, and 3 miles per hour in the dark. 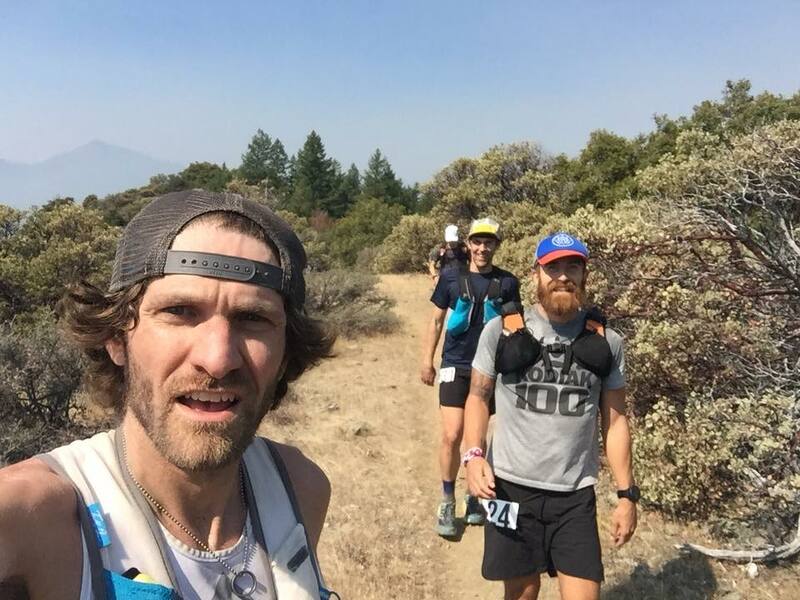 I banked a few miles during the first 50k, only to lose them back around mile 50. Though I was drinking all of my water between aid stations and refilling every time, I just kept becoming more and more dehydrated. As I became dehydrated, my pace slowed. As the sun went down, the coolness of night finally let me catch up on water. As I became more and more hydrated again, I began moving faster and faster all the way to the end, moving at a rate much faster than I had been durning the day. Erik and I had a snafu at about mile 95. We had been on pace to finish at about 22:15, when we missed a turnoff and headed 2-3 miles in the wrong direction. This was our fault, the course was properly marked, we just got finish line fever and stopped paying close attention in favor of just hammering towards the finish, only we were not hammering towards the finish, we were hammering some other direction. So we had to backtrack. We did eventually get back on course, but we estimate the detour cost us about an hour, and turned our 100 miler into 105. After the long down hill I finished the race feeling great in a time of 23:11, finishing in 20th overall. Long story short. I ran 100 miles, got a belt buckle, pants stay up, but now racing season is over so it looks like it is time to get fat and sassy. Despite the darkness, the coolness of running at night can be a huge advantage. After mile 60, savory, not sweet, is the way to go.